Are you a small to medium sized business looking to buy an affordable multifunction printer or photocopier in Brisbane? Or is your current printer or photocopier in need of repair, general maintenance or servicing? 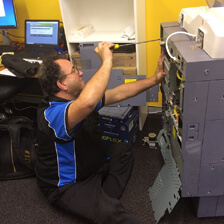 Contact the Copier Man on 0449 250 494 to talk with Richard, a local expert who has more than 30 years of experience in selling, servicing and repairing office equipment. In addition to offering high quality sales, repair and supplies (including toner and ink) for a wide range of office printers, you can trust the Copier Man to take care of the other big headaches as well. These include delivering, installing and setting up your machine so you can be up and running from the get go. We also offer onsite inspections of printers and photocopiers that are experiencing issues so you don’t have to take time out of your busy work day by travelling to our workshop. It doesn’t just stop there. We are renowned for our excellent after sales service and support by taking care of our customers anytime they have a question or issue relating to their printer or photocopier. We supply inks and toners on a ongoing basis as well. Office equipment can be rather expensive to buy brand new. Photocopiers, standard printers and multifunction printers in particular have a reputation of racking up a bill in the tens of thousands. Fortunately, you can now access such machines at a fraction of the price. We have a wide range of high quality, new and refurbished multifunction printers all offered at affordable photocopier prices. These are available for sale and immediate delivery anywhere in Brisbane or South East Queensland. To accompany your printer or photocopier, we also offer genuine or compatible toner and ink cartridges. Best of all, we will take care of the delivery, installation and setup of your machine so you can have it up and running in no time! All our products and repairs come with a warranty and ongoing after sales support. Not only that, Richard, the owner of the Copier Man, is a highly qualified technician who has over 30 years experience under his belt and professional technician training from Toshiba themselves. Having worked for companies including Toshiba, Key Communication and Minolta, Richard brings a breadth of knowledge and experience to the table. He also brings 100% commitment to providing you high quality products and service while saving you big dollars. When you purchase from the Copier Man you are not just purchasing a piece of hardware. Richard runs a service first business which is what sets him apart from most of his competitors. He understands the importance of your photocopier repair to your business, that’s why he offers very cost effective solutions for business printing, scanning and on- or off-site copier service and support. So if you are looking to buy or repair an office printer or photocopier and you’re based in Brisbane, look no further. The Copier Man can help you take care of all your printing and photocopying needs! If you are based further out than Brisbane, we may still service your area. We have many satisfied customers extending from Northern NSW to Gympie, Stradbroke Island and Toowoomba. If buying a new machine is too big a commitment, we may be able to offer other alternatives such as renting the office machines you need for the length of time you need them for. Call us on 0449 250 494 to receive a quote, book an appointment or to find out how we can help you today.